I wanted to take my home-schooled children on a field trip someplace close to the Twin Cities, and a friend recommended taking a trip around Grey Cloud (Lower Island in Minnesota). My friend told me that there was plenty of nature, and it was less than 15 minutes from where we live. We drove down on a beautiful July afternoon and were amazed we lived near a spot like that! 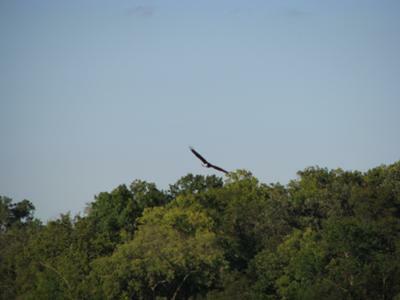 There are bald eagles soaring above the island, and a big nest only 40' across the water from the land bridge. We also saw about a dozen deer (they practically acted tame) and a few turkeys poking in the tall grass. The spot was a great chance to discuss the environment, and keeping nature clean by picking up some of the random trash that had washed up. I happened to have a camera in the van so we had a chance to review photography, and safely observing nature. I can’t recommend the spot enough, it’s not very big but it is rarely busy during the week. I hope you’ll get a chance to visit! For about three years now, my boyfriend and I have been going to the same spot to watch the eagles. About two weeks ago we had gone there and there was an eagle in the nest. They have a great spot for food: the ducks that hang out in the water below their nest and the fish in the water. We have not seen any deer or turkeys yet. I have pics of the nest with the eagle's head peeking out. It sounds to me like one of those off-road places that not many know about, but are sometimes the best. Next time I'm in the Twin Cities, I will have to make time to stop.